David Cronenberg is a master of the breakdown, be it physical (The Fly), mental (Videodrome), or domiciliary (A History of Violence). As his career as progressed, the director has shifted from the body horror that defined his early work to a more highbrow, if still penetrating, exploration of physical, moral, and societal decay. 2012’s Cosmopolis was a misstep that failed to effectively satirize capitalist chaos. Maps to the Stars is step back in the right direction, focusing more on dysfunctional characters as they navigate into the abyss. The film is light on Cronenberg’s signature whacko pizzazz, perhaps by ironic design, but it could benefit from a little less desensitization and little more pluck. Fresh off the bus to Los Angeles, Agatha (Mia Wasikowska) capitalizes on a Twitter relationship with Carrie Fisher and parlays the acquaintance into a job as personal assistant to fading star Havana Segrand (Julianne Moore). The frazzled actress hopes to revive her career by playing the same role that made her now-deceased mother a star. Havana relies on motivational expert/sham Stafford (John Cusack) to sort out her issues. Stafford can’t even manage his own life with wife Christina (Olivia Williams), who acts as manager for their teenage son actor Benjie (Evan Bird). After starring in a huge hit, Benjie fell into addiction and is trying to revive his career and cash in with a sequel to his box office smash. Dealing with despair and ghosts of the past – for some characters quite literally – the collection of damaged individuals struggle to maintain control. The character mosaic clearly communicates screenwriter Bruce Wagner’s sneering view of the Hollywood lifestyle, though it’s often too on-the-nose. Benjie is an entitled kid who constantly chugs energy drinks and visits a sick girl in the hospital only out of obligation and opportunity at self-promotion. We don’t need him to go on a hate-speech laced tirade directed at his agent to further establish that. Agatha is clearly disturbed – we’re told fairly early on of her dark past, and she wears the scars of her sins in the burns on her face and elbow-length gloves that hide her arms. Wasikowska does a fine job of portraying a quiet, smiling-on-the-outside kind of psychosis, which doesn’t benefit further from multiple recitations of Paul Eluard’s poem “Liberty.” That thing is repeated more than Dylan Thomas in Interstellar. It’s an empty refrain we know will be mined for attempted profundity in due time. It doesn’t work. Connectivity is also an issue with uniting the character pastiche. Of course “everything is connected” in this web of despair, but the lack of consistent conflict between the souls who are dead inside is dulling. Moore stands out as the vapid, unbalanced Havana, but we only get her in fits and starts as the focus nebulously shifts between plot strings. Though Cusack is given a few gems of dialogue – like telling Havana she’s holding her anguish in her thighs – he and Williams mostly fade to the background until the climax. The one character that’s property overshadowed is a struggling actor/limo driver played by Robert Pattinson, but him being an obvious surrogate for the filmmakers shepherding us on this gloomy journey is too obvious to allow identification. 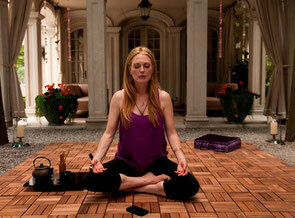 Even though the wounds cut deep and the past comes back to viciously haunt, Maps to the Stars is a tad too antiseptic to carry the desired dramatic weight.